At Delta Dental of Colorado — the state’s largest dental insurer — we know that businesses need a healthy workforce to stay productive. And oral health is critical to overall health. While eight in ten employees in large companies have dental insurance, only four in ten small-business employees have dental insurance. Because individuals with dental insurance are twice as likely to see a dentist, small companies that offer this benefit have a better opportunity to keep their employees healthy. 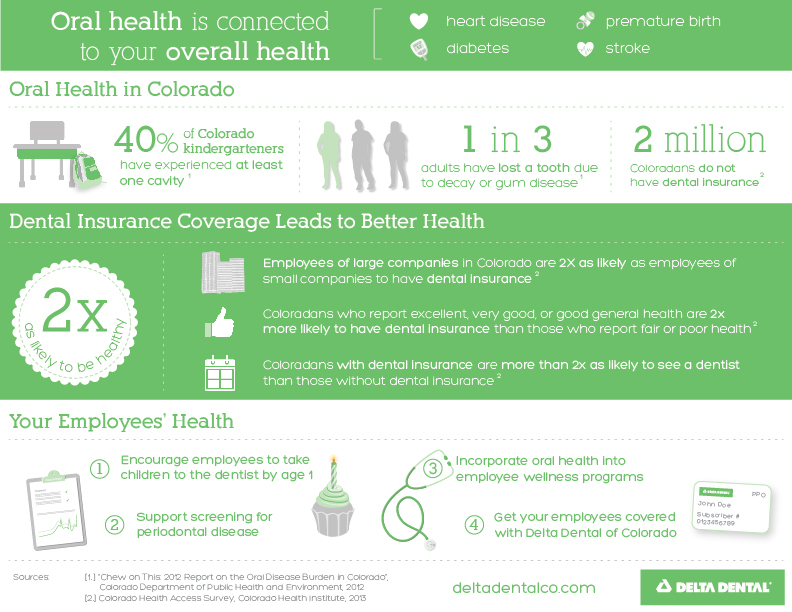 Delta Dental of Colorado has a new low-cost option for groups of 51 to 100 enrolled employees that businesses can offer in addition to another Delta Dental plan or as a stand-alone option. With this plan, diagnostic and preventive services are covered at 100%, basic services are covered at 60%, and discounts are available on major services. In addition, diagnostic and preventive procedures do not count against the annual maximum. Subscribers must see a Delta Dental PPOSM dentist for services to be covered, which gives them access to more than 2,000 dentists across the state. This low-cost plan joins our other plans for small groups of 5 to 100 enrolled employees. As an added incentive, DDCO is offering brokers a great way to help their community while they find the best dental coverage for their business clients of 51 to 100 enrolled employees. Through June, for every quote requested for business groups of 51 to 100, we will give the broker a $50 gift card that can be donated to the charity of their choice. To get a quote on this new low-cost plan and other plans for businesses of 51 to 100 employees, email SalesTeam@ddpco.com.